Great choice! 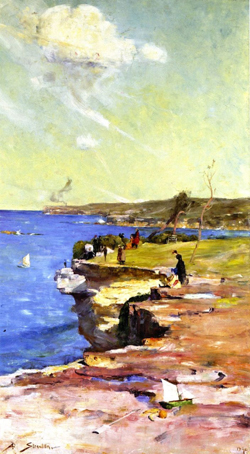 Arthur Streeton was one of my favourite artists from the Heidelberg School of Art. From the late 1880s the young men (and a few women) started painting en plein air in the rural-based outer suburbs of Melbourne. Blue Pacific was, as you noted, painted in Sydney where the cliffs are much more dramatic. But the big difference was Streeton’s works were usually landscape-shaped and wide. Blue Pacific was portrait-shaped and tall.